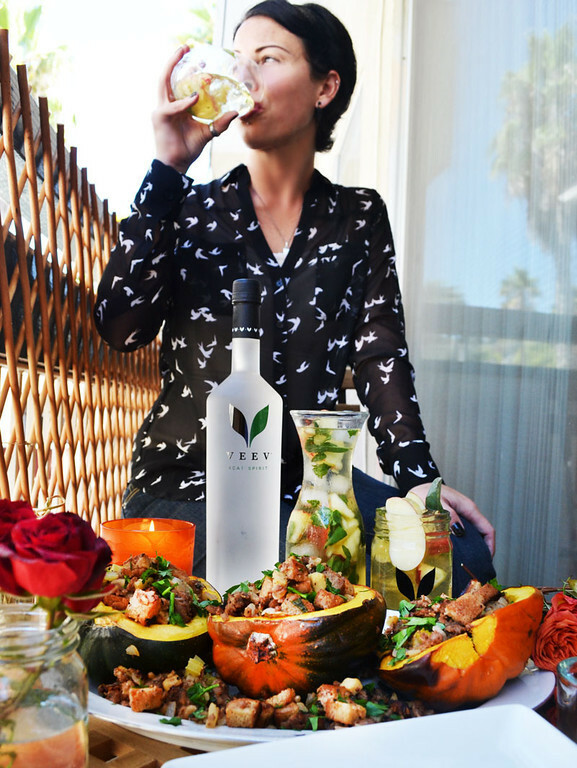 A couple months ago I was contacted by VeeV and asked if I wanted to make a dish to pair with one of their signature cocktails for an upcoming feature. Without hesitation I gave them an emphatic YES! I love VeeV. As you may remember, during the month of September I made weekly cocktails using this earth-friendly Açaí Spirit: my take on a mojito, pomegranate ginger concoction, citrusy basil spritzer and a warm apple cider. Needless to say I was stoked at the chance to work with VeeV!! Muddle one apple slice and sage leaf in a shaker with green chartreuse and simple syrup. 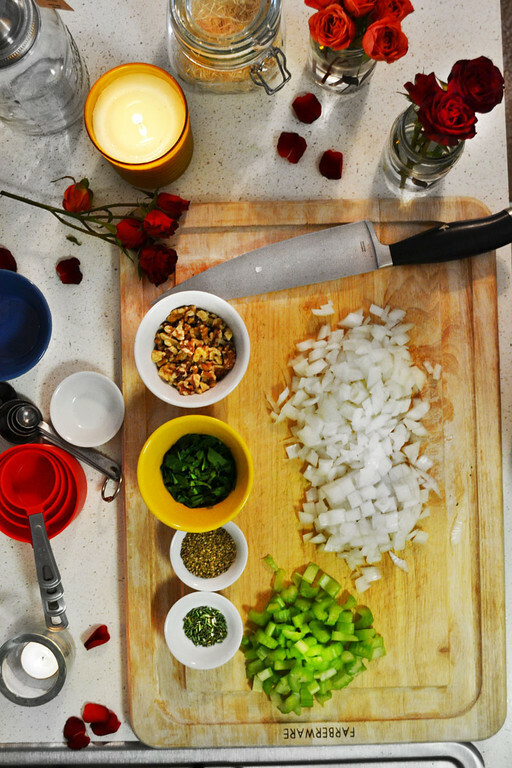 Add VeeV and shake ingredients vigorously. 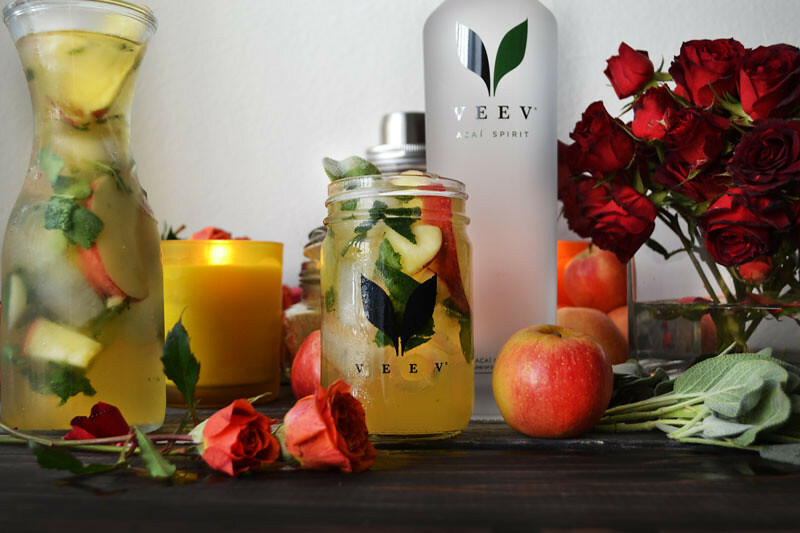 Pour into highball glass (or adorable VeeV mason jar) and top with sparkling apple cider. Garnish with apple & sage. Even though the shoot was in the middle of September and it was hot as hell outside, I wanted to make a warm comforting meal full of fall flavors to compliment the cocktail so I decided on a stuffed acorn squash. I filled the inside with a walnut, sausage & apple stuffing. 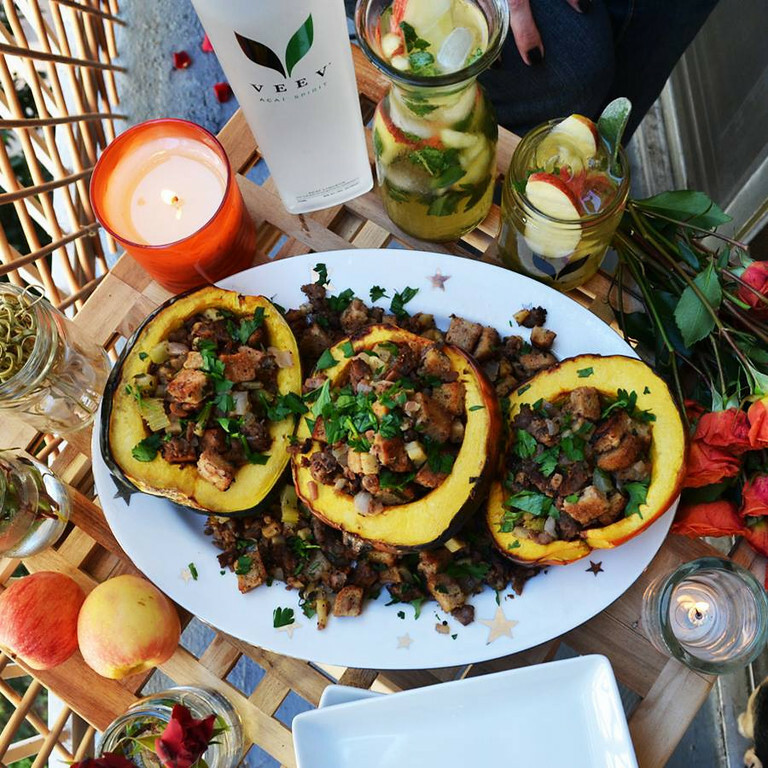 Acorn squash is one of my favorite foods and there is something so satisfying about sinking your fork into the dish and coming up with all the different textures and tastes in one bite. So good. I mean, like, really really good. This recipe will most likely be the staple of my Thanksgiving dinner this year (sorry Tofurky!). It’s kind of a complete meal in itself, but add some mashed potatoes and green bean casserole and you’re set for a scrumptious holiday spread. It was a ton of fun (and a little nerve-racking) to cook for strangers while they took pictures but Sharie and her assistant Johnny were so sweet and down to earth I instantly felt comfortable. Plus Johnny played fetch with Henry over and over, so he wins in my book. The cocktail was probably one of the best drinks I have ever had in my entire life. No exaggeration there. It was a seriously incredible drink. Sweet, but not overly so. A little fizzy from the sparkling cider and bursting with the flavors of fresh sage and apple. Man, I wish I had one in my hand right now! If you haven’t already, you must try this delectable Açaí Spirit, it will change your world. 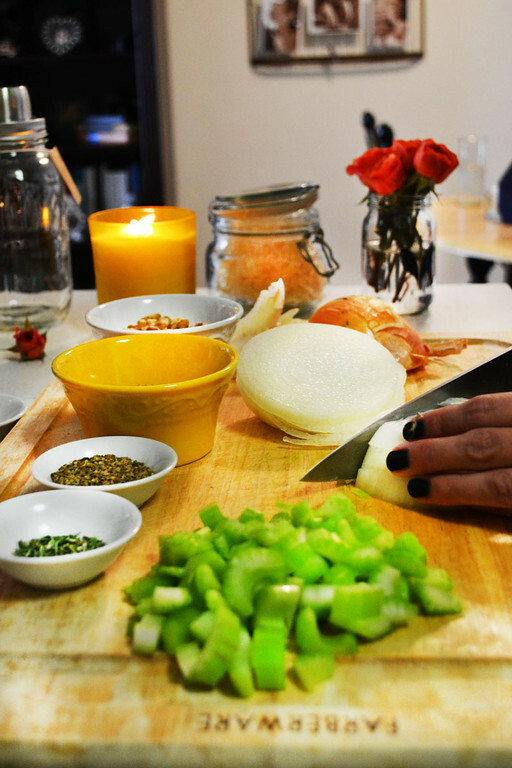 Be sure to head on over to VeeV’s Facebook Page this week to check out my feature and they’ll be running contests for all kinds of fun prizes as well! !